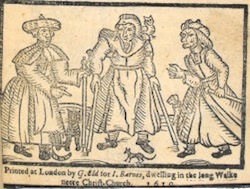 Woodcut from the title page of a pamphlet about three witches executed in 1618. After Macbeth has become king, Banquo has a soliloquy in which he reflects on what Macbeth has done: "Thou hast it now: king, Cawdor, Glamis, all, / As the weird women promised, and, I fear, / Thou play'dst most foully for't" (3.1.1-3). Banquo then wonders if the witches' prophecy about him will also come true.